Is your health where you want it to be? Would you like to get out of pain without having to resort to drugs or surgery? At Deerfield Health & Wellness, we provide our valued patients with safe, natural and effective chiropractic care that produces superior results. 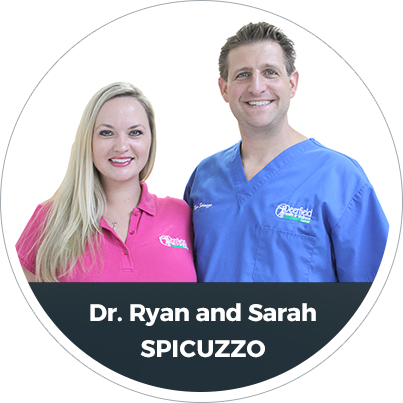 From treating infants with earaches, to snowbirds with golfer’s elbow, Deerfield Beach Chiropractor Dr. Ryan Spicuzzo sees patients of all ages and conditions. In addition to chiropractic, we feature an array of noninvasive therapies to promote healing. These include spinal decompression, which is a state-of-the-art way to help heal bulging, herniated or arthritic discs in the spine. 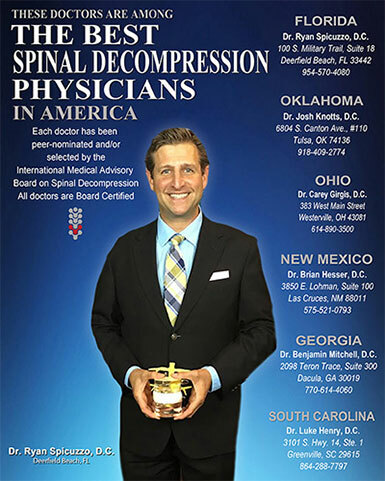 We are honored to have been selected by the International Medical Advisory Board on Spinal Decompression as one of the best Spinal Decompression Physicians in America! We also offer cold laser therapy to provide safe and drug-free pain relief and massage therapy to reduce muscle tension and relieve stress. 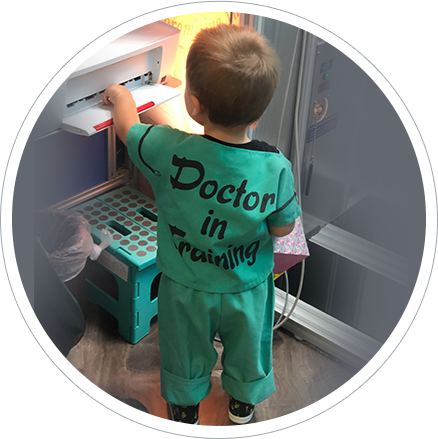 Dr. Ryan became a chiropractor because he believes it’s the best way to help the most people in a highly practical way. Since he began practicing in 1999, he has honed his adjusting skills and provides exceptional care to his patients. He has an excellent bedside manner and will take the time to listen to your concerns and provide individualized solutions to meet your needs. 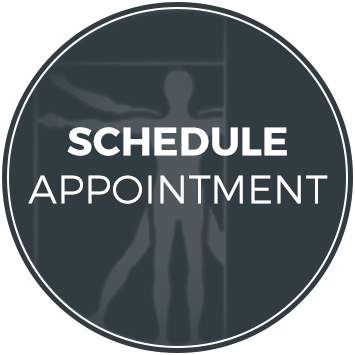 Our warm and friendly chiropractic office is open four days a week (including Fridays) until 6:30 p.m. We also feature same-day appointments so if you wake up in pain, we can get you in to see Dr. Ryan that day. We also pride ourselves on running on time, so you don’t have to wait. If you’ve been searching for a Chiropractor in Deerfield Beach who features state-of-the-art care, contact us today to book an appointment with Dr. Ryan! Find out for yourself why our practice is the recipient of nearly 100 five-star reviews on Google! Ed was very good. He took his time and listened to what I wanted. I loved my experience, and will go again! Thank you, to Sarah and the staff! It was wonderful meeting Dr. Spicuzzo! Your staff and services were really accommodating as well as pleasant. I will probably be back. Thank you for your accommodating service to me. Amazing experience!! I will definitely be coming back. Everyone was professional, and caring. I will love to come back again! Very good first visit. I felt that Dr. Ryan will spend enough time with me to treat me as a person, not just a body. Best chiropractor I ever saw! Thanks to Dr.Spicuzzo and staff. The doctor and staff was extremely professional, sweet and very caring. Thank you for a wonderful experience and all the knowledge shared will definitely continue as a loyal patient. Great experience. Very happy and I will most definitely be back. Great massage, great staff, and great experience. Keep up the good work. Thank you! Dee was great! Very professional and educational! Will recommend this place to friends and family! Amazing staff and very caring doctor! I loved the energy of your office!!! Eddie is fantastic. I can’t wait to use your practice again!! Everyone in the office was extremely helpful and kind. I was welcomed and I felt like my concerns were heard. I will definitely continue visiting the office. I would recommend this facility. Thanks ! Love the staff. Very welcoming and personal and the atmosphere is very pleasant. Great idea that both practices combined. Friendly staff! Greetings, Mr. Eddie exceeded my expectations and understood exactly what I needed. Thank you all so much for allowing me to be the winner of such a relaxing prize. I will definitely be back soon. Very nice staff, great listeners, and got my weak points on point! Really great and helpful staff !!! Loved the decor of the office, super friendly and peaceful. Dr Spicuzzo eliminated my lower back pain on the first visit. Couldn’t be happier, entire staff is wonderful! Extremely friendly personable and genuinely concerned. If you've been to other doctors' offices that seemed on the cold and clinical side, you won't feel that way at our practice. You'll be greeted at each visit and made to feel like you're the only person who matters. You could say we give every patient the celebrity treatment!